Modest, honest and robust, this modular family retreat located in the picturesque Perth Hills pays homage to the simplicity of a barn and to its owners’ European heritage. 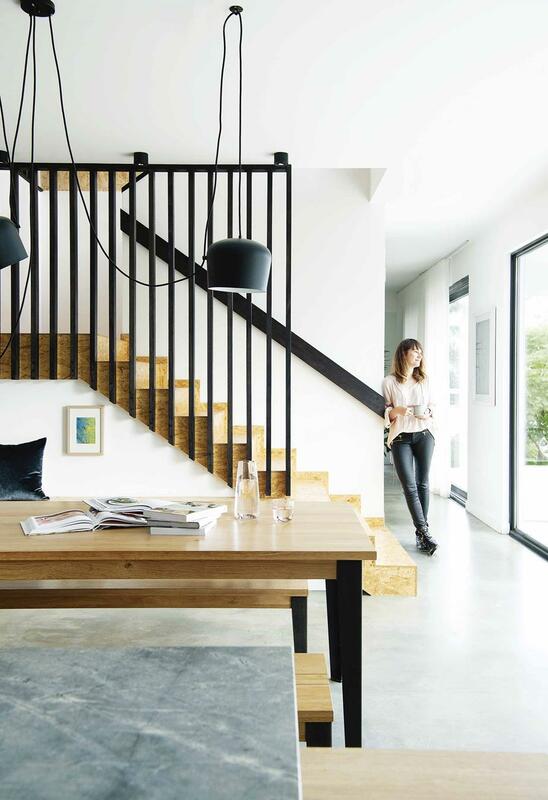 Who lives here: Izabela Katafoni, owner and managing director of building design company, Studio Origami; her husband Lukasz Katafoni, a site supervisor; sons Nikodem, 8, and Bruno, 5; and their rescue greyhound, Matty. Style of home: A four-bedroom, three-bathroom European barn-inspired modular home in Perth's Darlington. Timeline: With Izabela designing the home and Lukasz shouldering costly jobs, the home was built in four months. Budget: An initial budget of $400k was increased to $500k in order to afford better-quality finishes. Sitting on their first-floor balcony, gazing out across their undulating 2800-square-metre property and surrounding eucalyptus-studded valleys to the Perth CBD, Izabela and Lukasz Katafoni couldn't be further away from the busy streets of Szczecin, the Polish city in which they were both raised. The couple emigrated to Perth a decade ago and settled briefly in an inner-city suburb. The birth of their sons, Nikodem and Bruno, soon followed, and with them came a hankering for a more natural, outdoorsy lifestyle – a home with a greater connection to nature. Darlington, located in the gently undulating Perth Hills, seemed the ideal location. "We were so drawn to the potential in this block," says Izabela. "We fell in love with the view over the valley to the city, and the fact that we are hidden in this bushland. Exterior The roof and first floor of Izabela and Lukasz Katafoni's Perth home are clad with Colorbond 'Trimdek' in Monument, while the gable wall is clad in Scyon 'Axon' from James Hardie in the same colour. Scyon 'Matrix' cladding in British Paints Grey Spirit is used on the ground floor. The concrete paving was hand-poured by the couple. "For us, choosing to build here was about our family being able to enjoy a more relaxed lifestyle. The nature around us makes us feel safe, and it's more calming. When we return home after a tiring work day, we come back to this wonderful view and it's just extremely soothing." Exterior Windows along the northern side of the home invite the breathtaking valley views inside. "Capturing the views was very important to me," says homeowner Izabela. "The windows are supposed to act as picture frames. Darlington seemed perfect for Nikodem and Bruno as well. Instead of burying their heads in iPads, the rambunctious young boys now spend hours clamouring through their cubbyhouse – built by their father – scaling their own personal climbing wall and exploring their magical wooded backyard. "There is quite a bit of forest in Poland and that was my playground as a child," says Lukasz. "We want for our kids to be able to go out and play, like we did growing up – to not always be watching TV." Dining area The cork-like OSB staircase complements the stained black oak balustrade, made by Lukasz. The Industrial M dining table and bench seats are from Curious Grace. The basis of Izabela's design concept stemmed from this desire for a simple, honest lifestyle, and the barn-style architecture that is common in her native Poland. She also drew inspiration from the relationship between the property's natural environment and man-made objects. 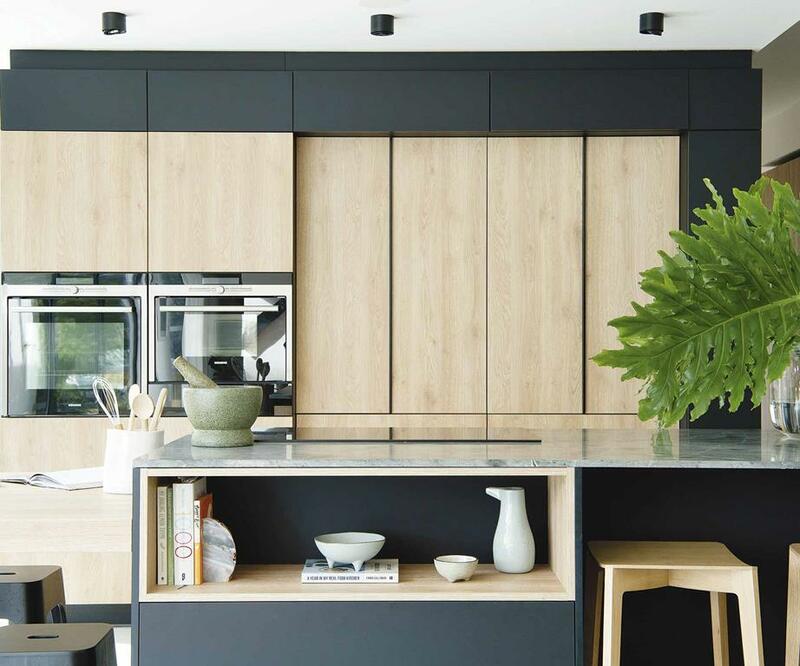 In the kitchen, polished concrete floors, black laminate surfaces, granite benchtops and powder-coated stainless steel contrast with more natural features such as the staircase made from oriented strand board (OSB) – an engineered cork-like wood product – and the blonde timber laminate of the kitchen cabinetry. Staircase Izabela's pursuit of affordable and durable materials led her to choose oriented strand board (OSB) for the staircase and upstairs ceiling. "It was very economical and a good solution to tie the upper floor to the ground floor," she says. "The OSB adds texture and warmth." "We both like minimal design that's a bit industrial but also raw and robust," says Izabela. "And in the Polish countryside, you see a lot of this barn shape with very high-pitched roofs. The height and volume this creates makes areas seem more light and spacious." Kitchen Egger black matt laminate and blonde laminate custom cabinetry imported from Poland cover one wall. 'Aki' stools from Feelgood Designs introduce more black into the picture. The benchtop is granite in Blue Moon from CDK Stone, the ceramics (on the shelf) are from Empire Homewares and the utensil holder is from Winterwares. Appliances, Siemens. Mortar and pestle, Featherhorse. The entire two-level, four-bedroom home was completed using modular panels from Perth company, Sips Industries. Energy and cost efficient, the SIPS (structural insulated panels) are resistant to termites, fire, severe storms and cyclones. This makes them ideal for the bushfire-prone area and Western Australia's harsh weather. "I love this product," says Izabela. "People think modular construction must look like, you know, a shipping container or something – but, really, this is just a standard-looking building. In fact, using modular panels to build was such a positive experience for us. It helped us build much more quickly than a traditional build, and at a cheaper cost, too." Living area Stephanie Reisch's artwork Towards The Delicates dominates and sets the tone. The sofa is from GlobeWest and the cushions are all from Asbury Park Agency. The coffee table is from Behind The Door Collective, the overhead lamp is from Natuzzi and the 'Elise' table lamp is from The Montauk Lighting Co. A 'Cesar' rug from Tribe Home adds texture. Vase and citrine stone, Asbury Park Agency. With the help of her interior designer friend, Vivien Hegedus from ViViDesign, Izabela selected a colour palette inspired by the Perth Hills. 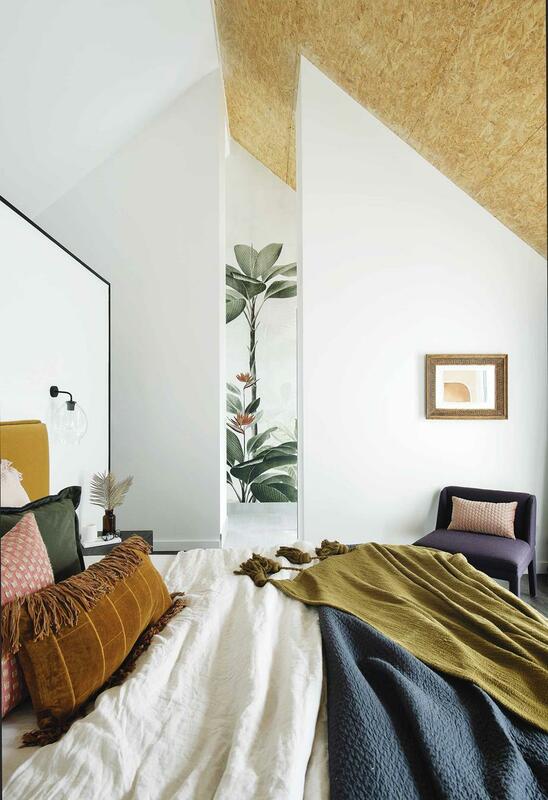 Tones of olive, sage, ochre, mustard, charcoal, saffron and chocolate bring the outside in through furnishings, wallpaper, lighting and botanical artworks. 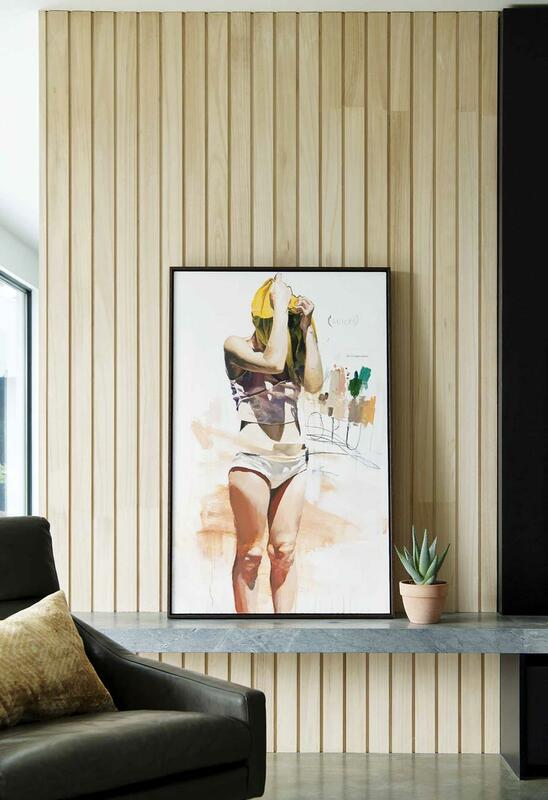 Master bedroom and hallway In a corner of this room, an Arthur G armchair lets Izabela and Lukasz sit and admire the view and Lily Nicholson's artwork. All the flooring upstairs is 'Tally Oak' in Oiled Charcoal from Aspecta Flooring. Further honouring the bushland setting is its commitment to environmental sustainability. Beneath the slab, a foundation of Cupolex recycled polypropylene domes interconnect to provide a durable formwork and continuous airflow, which regulates the internal air temperature. The home is packed with water-saving and renewable-energy systems, earning it recognition as an HIA GreenSmart project home of the year for 2018 in WA. Ensuite An oversized mirror from The Block Shop hangs above custom cabinetry imported from Poland and a basin from Prodigg Bathrooms. Next to the Prodigg bath, a stool from Empire Homewares serves as a side table. The owners also imported the statement pendant light from Poland. Through clever, affordable design, Izabela and Lukasz have created a home that's energy efficient and homely. Yet it's hard not to look around and wonder if Darlington truly is their forever home, considering their families live half a world away. Ensuite In the ensuite, dramatic 'Botanical Bliss' wallpaper from Origin Wallpapergives the impression of looking directly into the garden through a window. Towels, Empire Homewares. "Absolutely!" says Lukasz. "We love it here. We could never have achieved in Poland what we have here – not the same space and quality for the same price. The standard of living is so much better, and look at this view. Who wouldn't want to live here?" Master bedroom Cushions from Asbury Park Agency, Adairs, HK Living and Freedom, and Adairs bedlinen and throws, enliven the all-white palette. A Søktas sconce casts light at night and is mounted on the reverse of the walk-in robe behind the bed. "We had a problem on this particular site with the soil," says Lukasz, "In the Perth Hills, the soil is typically made of clay, and you're not able to build on that – as it's too unstable – without removing the clay sand first, which is very costly." After much research, Izabela found an affordable solution in Cupolex, a building system made from recycled, non-toxic polypropylene domes, which interconnect across a site's footprint to create a self-supporting structure that acts as permanent formwork. When the slab is poured over the top, it means less concrete, steel and labour, saving time and money. Final polish Set the scene with textured and colourful finishing touches to suit any space. 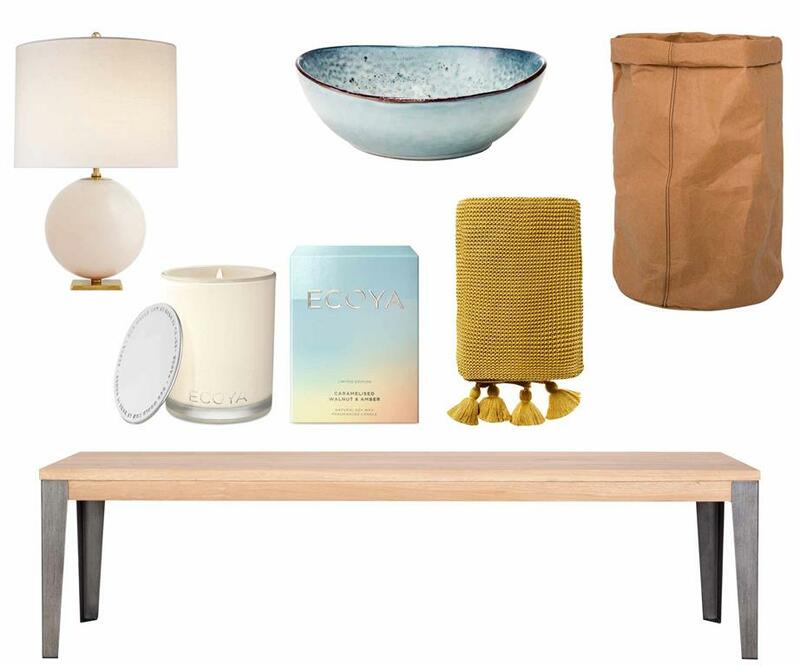 Get the look (clockwise from left) Kate Spade New York for Visual Comfort & Co. 'Elsie' table lamp in Blush Painted Glass, $792, The Montauk Lighting Co. Nomad soup bowl in Grey, $16.95, Salt & Pepper. Sax large storage bag, $30, Freedom. Industrial M bench seat in Graphite, $639, Curious Grace. WinterEscapes limited-edition candle in Caramelised Walnut & Amber, $49.95, Ecoya. Home Republic 'Casbah' throw in Mustard, $99.99, Adairs.